The leading international consumer goods trade fair. Ambiente covers the entire spectrum of consumer goods in three areas: Dining is the most important forum for the table, kitchen and household. Giving welcomes you to the world of gifts and accessories. And Living focuses on lifestyle, furnishings and decoration. The Ambiente 2019 exhibition will be held from 8 to 12 February 2019, Frankfurt Am Main, Germany. 8. – 11. February 2019: 9 a.m. – 6 p.m.
12. 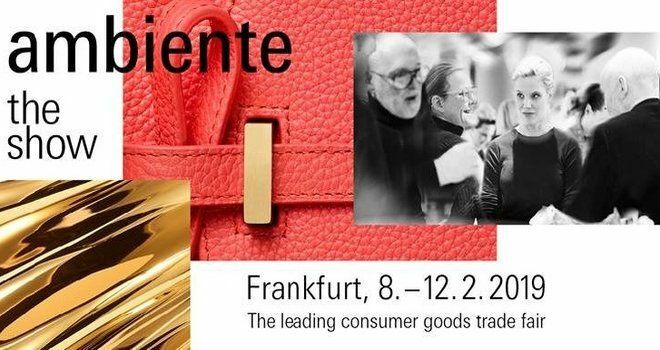 February 2019: 9 a.m. – 5 p.m.
Why exhibit at Ambiente 2019 Frankfurt? Exhibit at Ambiente and showcase your products in a pulsating environment that is perfectly attuned to your requirements. Around 135,000 trade visitors from 167 countries come here to order their product ranges for the year, make newcontacts and find out more about current market developments.